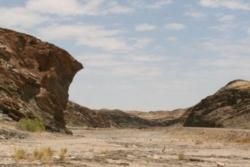 As the dry Kuiseb River snakes through the landscape it carves up the central plateau of Namibia to form a gorge. In his book "The Sheltering Desert" Henno Martin recounts the amazing story of his survival along with fellow geologist Hermann Korn. The two German men hid in the rocky arms of the canyon for more than 2 years to escape imprisonment while WWII raged throughout the world. The canyon is visible on the C26 gravel road from Windhoek and falls within the boundaries of the Namib Naukluft Park.